Bartow Elmore is an assistant professor of U.S. history at the University of Alabama and a regular attendee of the Business History Conference. He does research that straddles the line between business and environmental history. 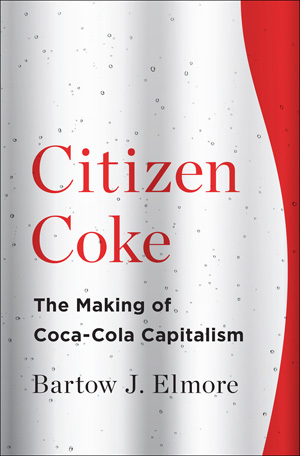 He has published an article in Fortune that gives readers the main highlights of his new book Citizen Coke: The Making of Coca-Cola Capitalism. Essentially, he argues that Coca-Cola’s business model involves externalising as many of the environmental costs associated with production as possible. I call this money-making approach Coca-Cola capitalism. Coke followed this path throughout the 20th century. It involved getting others, whether it was government-owned water works or vertically integrated sugar refineries, to invest in the production and distribution systems needed to turn the “Real Thing” into a real thing. What made Coke great, in other words, was not really what it did, but what it didn’t do. It proved incredibly adept at getting independent businesses and local governments to bear the majority of the costs of producing and distributing its products. To what extent was Coca-Cola’s competitive advantage due to a greater willingness/ability to shift environmental costs to others than its rivals? Why did the legal and political systems of the countries Coca-Cola operates in allow the firm to get away with the arrangements Elmore views as bad for overall social welfare? To what extent did the weakening of common-law remedies for environmental externalities in the United States encourage Coca-Cola to pursue this strategy?